Well, It’s been a while but on Sunday we had a great time at Dodger Stadium. It was a early afternoon game and we talked to Ben Platt of mlb.com and he hooked us up with press passes and got us on the field for b.p. After we watched a few players take some hacks Ben took us up to the press box where we got to meet Dodgers radio announcer Rick Monday and then we had the chance of a lifetime. We met Tommy Lasorda and Vin Scully. After all that we went to Ben’s office and he showed us how he conducts business and then took in a great game. The Dodgers won and we got to see Rickie Ledee hit a home run and we saw Gange come in and pitch a 1, 2, 3, inning. What a beautiful ballpark. I would have to say that Dodger stadium is one of the very best parks we saw on the trip. As far as experience; We will never forget it. Thank you Ben for hooking us up. 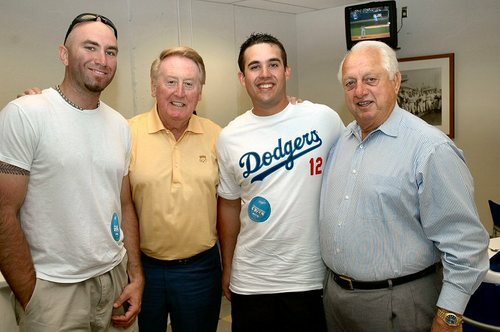 Talk about posing with Dodger legends. That’s Hall of Fame broadcaster Vin Scully second from the left and our fellow MLBlogger and Hall of Fame manager Tommy Lasorda on the right. Last week he was going 3-for-6 with three runs against the Marlins. Here, the Dodgers’ outfielder was hanging with a couple of guys just on a Ballpark Tour of Duty. Here we are behind the batting cage before the Angels and Dodgers took BP in their Interleague game.